Some rucksacks are heavy and cumbersome, while others are a joy to wear. Trail’s testing team headed for the hills with a bunch of 30-40 litre rucksacks to find the very best ones for you. Body contact is kept to a minimum, thanks to Berghaus’s trampoline-style Freeflow back system. The main compartment is accessed via a well-designed fixed lid and by a shorter side zip towards the base of the pack, so you can stuff waterproofs or other items in the base of the main compartment if desired. There are four zipped pockets – a generous one on top of the lid, a smaller one on the inside of the lid, one on the front of the pack and one on the hipbelt. If using trekking poles, some may prefer the side compression straps to have had quick-release buckles for easier attachment of poles or other items to the side of the pack. But overall this pack fitted me well and the only niggle was there was no back length adjustment for those that may need it. The Altus ND30 is a new pack that has been specifically designed to fit women, following research with Leeds University, so the hipbelt, shoulder straps and back should be more comfortable. The Air Contour back system also allows the shoulder straps to be raised or lowered for fine-tuning of back length, and is shaped to allow a little more airflow than some other packs. The main compartment is protected by a fixed lid with two nice big pockets. There is also a useful front zipped pocket and a zipped side entry to the main compartment, so if needed you can access items outside of any rucksack liner easily. Overall this rucksack fitted me well and felt comfortable for general walking in the valley or on the hills, and even while scrambling. If you need a more durable rucksack, then this is for you. It’s built from Fjallraven’s popular G-1000 Heavy Duty Eco fabric, comprising 65% recycled polyester and 35% organic cotton, which can be customised by adding Greenland Wax for greater water resistance. The back system is padded and this sits comfortably against the back, but it doesn’t have the airflow of other designs. The main compartment has a floating lid that our testers were not keen on, but was better designed than most. The lid gets a nice large external and internal zipped pocket. There’s also a huge front zipped pocket and a more unusual zipped side entry to the main compartment, which allows you to stuff wet kit outside a waterproof liner. This well-seasoned rucksack offers more airflow across the back, less weight and can be yours for less cash than others, so why pay more? The Aeroflex Easy Adjust back system combines back length adjustment with adaptable tensioning of the trampoline-style back system to offer far more airflow control than most rucksacks. You can even adjust the back system while wearing it. I found playing with the adjustment options worthwhile, as on cold days it’s nice to have less airflow to help stay warm! In terms of loading it up, the top of the main compartment is accessed through a fixed lid and the bottom via a short zip on the front of the pack. Externally, there are two zipped pockets – one on the lid and one on the hipbelt – as well as two side mesh pockets and a large front stretch stash pocket that is great for a jacket. The side compression straps have quick-release buckles, enabling longer items such as trekking poles to be easily stowed. And it’s all available for less cash and less weight than many others. The second zipped pocket on the lid is only accessible through the main zipped pocket on the lid. All of our test team agreed that it would have been better to have had access to this pocket from the underside of the lid instead. Other packs also have extra zipped pockets, if that is your preference. It’s also worth noting that some of the higher-priced and heavier packs are also offering more capacity than this, so while this is great for smaller loads on day walks, for more adventurous day trips when you have more gear the larger packs may be a better option and an overall better investment if you regularly need more gear than this 30-litre pack can manage to carry. Finally, while this is comfortable, some of the higher-priced packs are even more comfy, and in some cases more durable too if you’re a really hard user. An extremely adjustable pack that is available at a good price and a good weight. 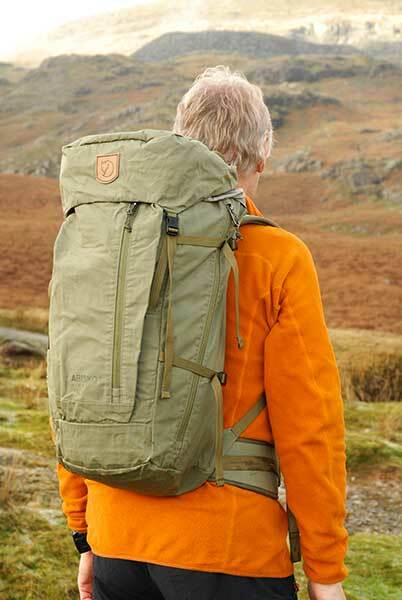 Great for general hillwalking, but pay a bit more and you can get extra capacity, more comfort and better durability. 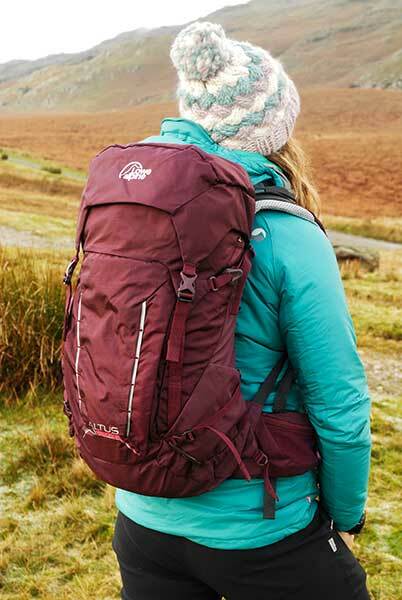 The Kyte 36 is the women’s version of the men’s Kestrel 38, so does this fully-featured design make it the go-to pack for all hillwalkers? so the overall effect is loads of comfort without being too hot. The main compartment is accessed through a quality fixed lid, so there’s no chance of water creeping under it, and there’s external zipped access to the bottom of the main compartment. The pockets on the lid and hipbelt are a good size and the big stretch pocket on the front of the pack is perfect for stuffing a waterproof between showers. Side compression straps and stretch side pockets complete this fully-featured rucksack. All those features add up, making this the heaviest rucksack here, so you have to ask yourself if you need everything this pack is offering; such as the adjustable back system, base compartment access and all those webbing straps. Even with all those features other packs offer more airflow across the back, although no other pack we tested was as comfortable as this overall. The men’s version offers two back length options, as well as adjustment, while the women’s has just one size but does have the same adjustable back length. This pack is also higher in price than some other options. If you just need a simple daypack with basic features, this is probably more than you need. Ideal if you need more packing options and maximum comfort. It isn’t the cheapest or lightest option out there, but the overall package can’t be beaten. 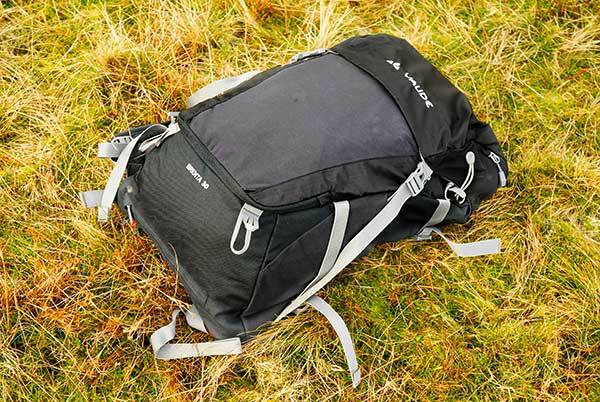 Does this new pack, with its close, stable fit and air ‘chimney’ for more comfort, provide everything a hillwalker needs? The new Trail Pro packs from Deuter are designed for those with bigger loads who need a stable, close fit that is also comfortable. The well-stiffened back panel means you can throw gear inside the pack without it distorting too easily. Two padded zones extend down the back with a ‘chimney’ up the middle for greater airflow, while very well contoured hip fins allow more weight to be carried on the hips in comfort. The main compartment is accessed via a nice fixed lid with internal and external pockets. You can also access the base of the main compartment via a front zip. I particularly like the big front compression panel, as it is far more robust and durable than many mesh designs used on other packs. On one side of the pack you get a huge zipped side pocket that is great for a water bottle, while the side gets a mesh pocket. The compression straps have quick-release buckles, so you can stash items on the sides easily. so in warm weather this does get more sweaty than other designs. Only having a zipped side pocket on one side and only having a mesh side pocket on the other does work for me. Although sometimes I had to repack my bag to balance it out, rather than just put the water bottle on the other side as I would if a pack had a zipped pocket on both sides. There is no length adjustment here, so this either fits or it doesn’t, therefore it’s worth trying before buying to be sure. This strong, stable pack is great for more challenging mountain days, but those with more airflow and less weight might be a better choice on easier hillwalks.